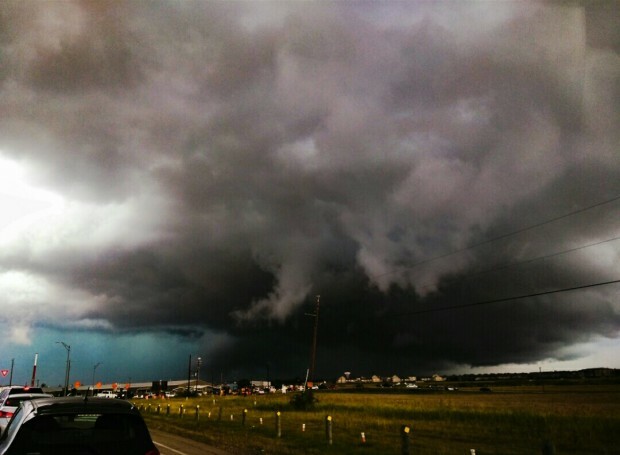 Heavy rainfall rolled through North Texas on Friday, causing flash floods that required water rescues, several house fires likely started by lightning strikes, and numerous crashes with injuries. One such crash involved a Dallas Fire-Rescue fire engine that rolled onto its side when responding to a house fire during the heavy rain. Four Dallas firefighters from Station 49 were on board the fire engine when it hit a slick spot during a downpour near West Ledbetter and Parkwood drives at about 8 p.m., according to Deputy Chief Kenneth Cullins. One firefighter who was riding in the back was taken to the hospital with minor injuries and was released shortly after. Three other firefighters were sore, but OK, according to Cullins. No other vehicles were involved. 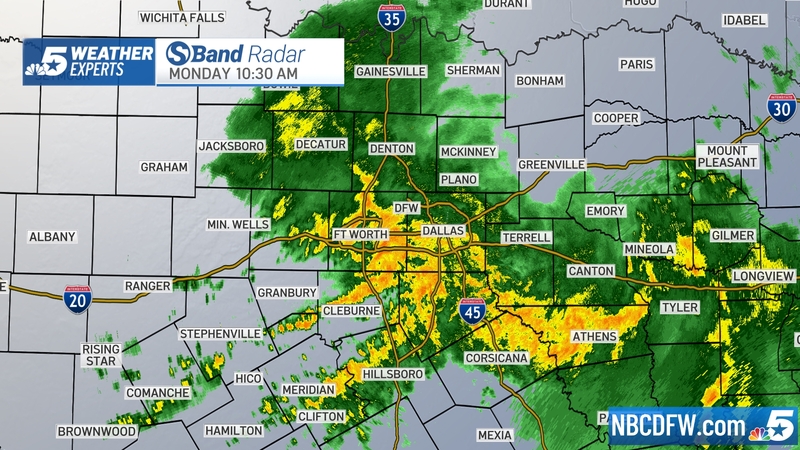 The National Weather Service has allowed flash flood warnings to expire, but a Flood Warning remains in effect for White Rock Creek and the Trinity River in Dallas. Flood stage for the Trinity is 30 feet, and the river is expected to crest at 32 feet Saturday morning, forecasters say. 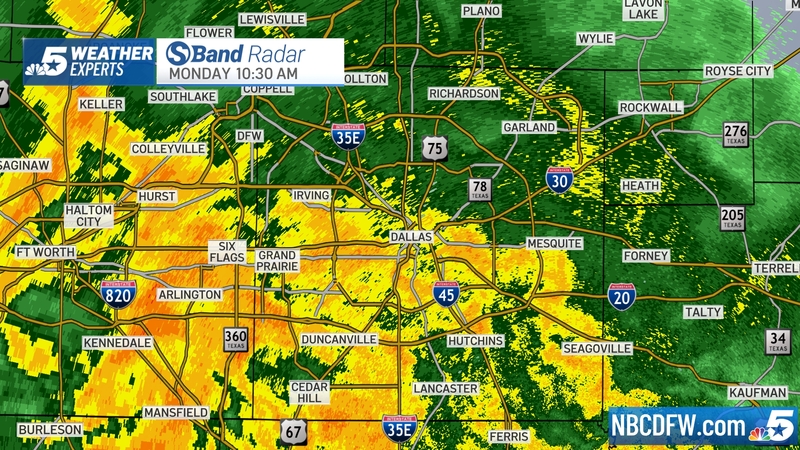 The Trinity River should fall below flood stage by Saturday afternoon, according to the NWS. 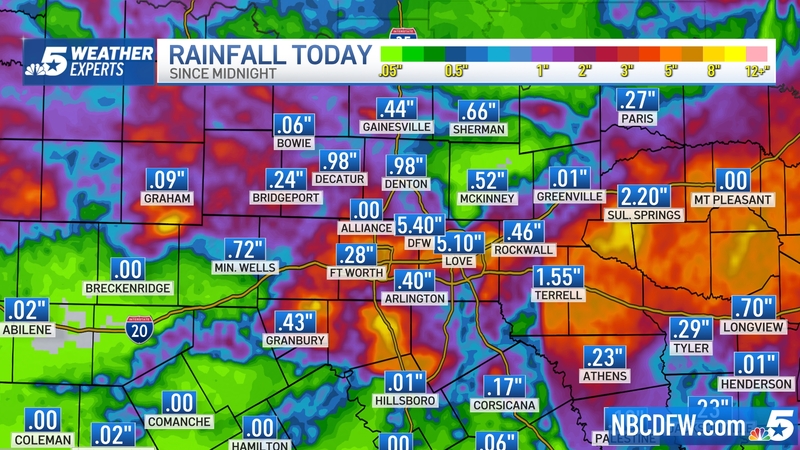 Most communities in North Texas picked up more than an inch of rain Friday, and the official tally at Dallas/Fort Worth International Airport was 1.71 inches of rain for the day. 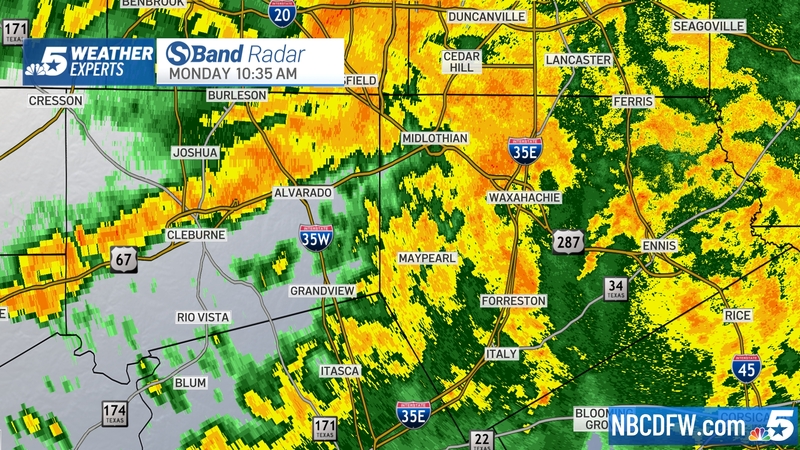 Still, many areas received much more rain. 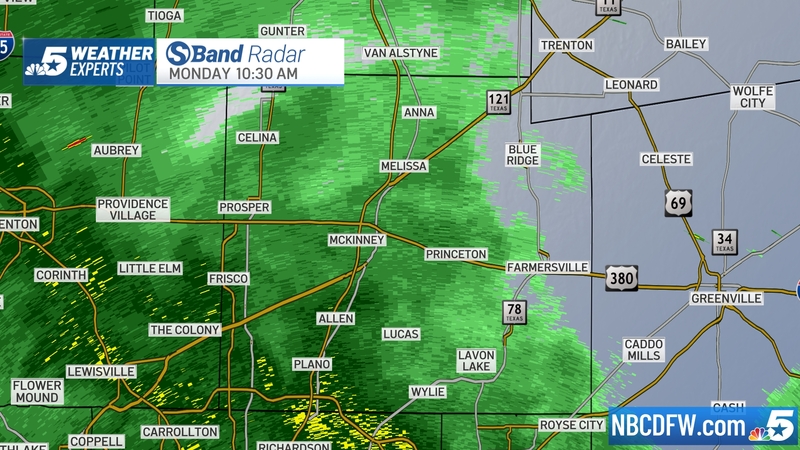 Alliance Airport north of Fort Worth reported four inches of rain in just a few hours. Fort Worth police are warning drivers to take it easy in construction zones this rainy weekend. Along Interstate 35W near Loop 820, they report seeing at least once accident a day, even in good weather. A wet weekend will make driving through the construction zone even more dangerous. Dallas Fire-Rescue said between 5:20 p.m. and 8:30 p.m. they responded to no fewer than 81 locations where they helped drivers trapped in high water. People await rescue, trapped by high water along Northwest Highway in Dallas near Harry Hines and I-35E. "Most, if not all, of these locations involved multiple vehicles trapped in water; and, in some cases, vehicles were continuing to drive into, and get stuck in, the same waters from which firefighters were pulling vehicles from," said Jason Evans, DFR spokesman, in a statement. Evans said the depth of the rescues ranged from two feet to fully submerged vehicles. 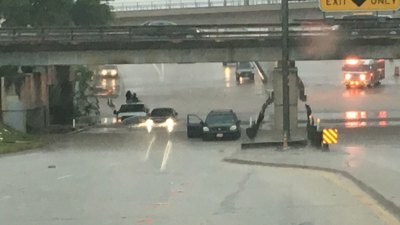 In Fort Worth, firefighters rushed to help a stranded driver after a caller reported a car stuck in high water up to the headlights near Precinct Line and Trinity Boulevard. According to information from Dallas' Flooded Roadway Warning System, the following roads remained closed Friday, June 2, at 9 p.m. due to flooding. Three people were checked for injuries after a roof partially collapsed at Sam Pack's Five Star Ford on the 4400 block of West Plano Parkway in Plano. The roof collapse took place at the dealership's service department drive-through, the Plano Fire Department confirmed. Nobody was taken to the hospital for further treatment. Dallas Fire-Rescue confirmed to NBC 5 Friday afternoon that three one-alarm house fires were likely the result of lightning strikes. The fires were reported at homes on the 3600 block of Woodleigh Drive, 10400 block of Coleridge Street and the 8500 block of San Fernando Way. In North Richland Hills, firefighters said lightning was the probable cause of a house fire on the 7000 block of Ridge Crest. 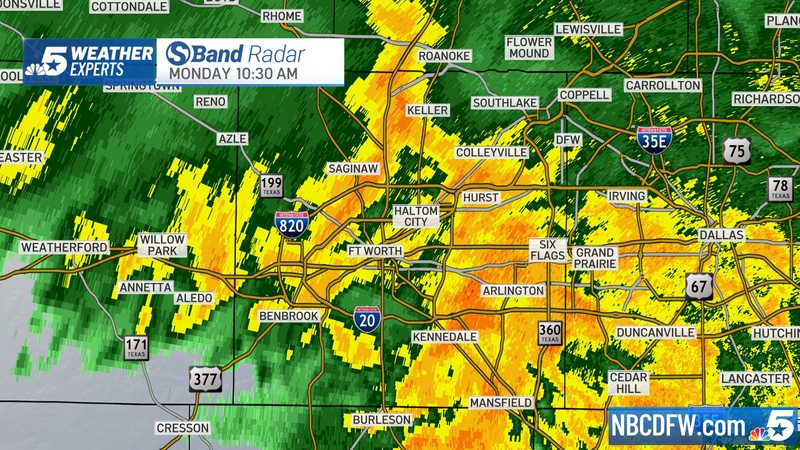 A fifth fire was reported in Plano where lightning is believed to have sparked a house fire at a home on Marathon Drive. 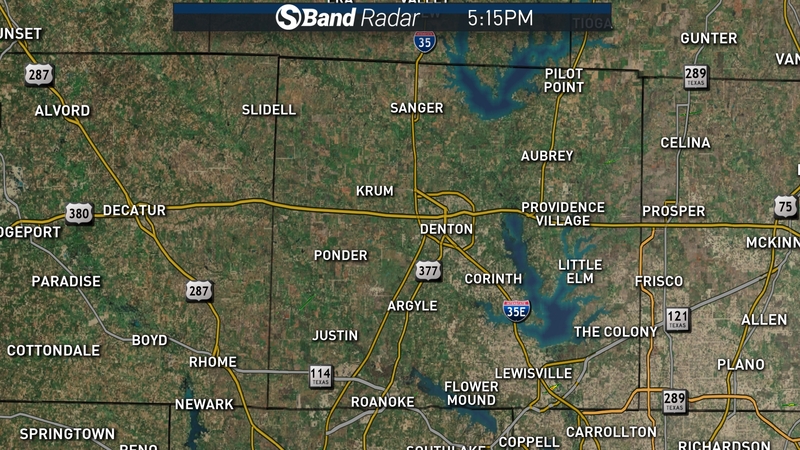 As of 6 p.m., Oncor reported about 14,000 customers in Denton, Dallas, Tarrant and Collin counties were without electric service. That is down from a high of more than 19,500 customers at about 5:45 p.m. At 4:15 p.m., only 1,600 customers were without power. 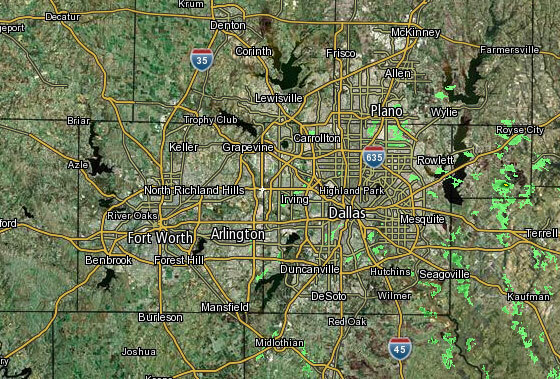 Flights out of Dallas/Fort Worth International Airport and Dallas Love Field were experiencing departure and arrival delays due to weather Friday evening. Delays were averaging three hours, according to the FAA, and several flights were canceled outright.